How confident are you that your vendors are charging you the correct sales tax on their invoices? Every year organizations of all sizes are incorrectly charged thousands and in some cases millions of dollars in sales tax by suppliers. It is safe to say that these hidden costs could have a large impact on your business and if you don’t have the right tools and processes in place to validate these charges – you may be blindly paying way too much. Now that financial institutions are a few years into AEOI reporting, we are starting to get a better picture of effective approaches, challenges and concerns surrounding the eve of CRS requirements. To this end, Sovos Compliance will present a third-party benchmark study that surveyed 100 financial institutions to gain insight into costs, concerns, challenges and solutions. Join Jeff Cronin, Sovos VP of Product, for an informative webinar to keep you in-the-know about penalties related to ACA reporting. - What you need to know about the “Best Faith Effort” for 2015 ACA filings and potential penalties. - Who will be (and should be) involved in managing the corrections and penalty abatement processes. - Best practices for minimizing corrections and future penalties. This webinar is designed for Human Resources, Benefits, Tax and Compliance Professionals who have reporting responsibilities under the Affordable Care Act. If you expect that you will be involved in managing the corrections or penalty abatement process related to 2015 ACA filings, this event is for you. We just finished the first year of ACA reporting 45 days ago and it’s already time to talk about next year. Join Jeff Cronin, Sovos VP of Product, on August 23 for an interactive webinar to go over what we learned in the first year of ACA filing and how we can leverage that information for next year. Who should attend? This webinar is targeted to provided valuable insights to Human Resources and Insurance professionals who have reporting responsibilities under the Affordable Care Act. If you expect to file a 1095 form in January 2017, this event is for you. Join us at 9am PT / 11am CT / 12pm ET on August 23 to learn more! The tax season is approaching and the IRS is getting ready to send out forms CP2100 and 972CG from the prior years’ information returns that contained incorrect name and taxpayer identification number combinations. Does the phrase "reverse audit" sound familiar? If you are a business operating in the retail or manufacturing space, you may be familiar with the concept of a reverse audit. These audits are designed to identify and recover tax over-payments remitted to suppliers or filed directly as a self-assessment of use tax. A reverse audit could help your business uncover over-payments and save money going forward. Sovos Compliance has partnered with KPMG to bring you a special presentation on reverse audits and how to minimize the risk with a software solution. Join us at 1pm EST on July 26th and hear Jamie & Nicole share their experience and provide the insight on the benefits and potential cost-savings an automated AP solution could give your business. This webinar will be presented by a team of experts from Sovos, including: Gerard Nelligan - Tax Counsel, Wendy Walker - Global Account Executive, and Mitchell Manor - 1099 Product Marketing Manager. Learn about the 1094 transmittal and corrections process moving forward. Organizations must transmit the 1094 electronic file to the IRS by June 30th. This transmittal creates a new set of challenges for organizations with its process and complexities. Once transmitted and filed with the IRS, organizations then must be prepared to handle the complicated corrections process it sets in place—as well as starting to think about next year’s ACA reporting. 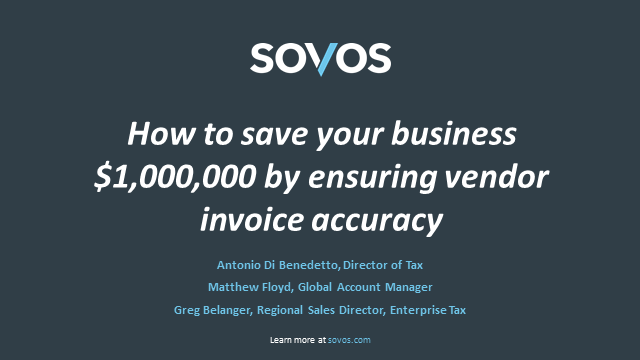 Join our Sovos Compliance tax experts, Antonio Di Benedetto and Gino Orlando, for insight into preparing for an audit. They’ll discuss best practices for audit preparation, some of the risks and pitfalls surrounding the audit process, and strategies for managing the state audit. They will also cover how you may trigger an audit, some of the challenges a taxpayer may face during an audit, and how to overcome those obstacles. Earn 1 Continuing Professional Education (CPE) credit: Additionally, we are offering 1 CPE credit for attendance, participation, and completion of the required questions in this webinar. Most of the main tax season deadlines have come and gone. It’s now time to collect your notes and start preparing your review to internal stakeholders. How do you compile this information and present this data in a clear manner that will help drive process improvements for next year? Sovos is presenting a complimentary webinar that addresses these concerns that will be hosted by Wendy Walker who has over 15 years of reporting and compliance experience, including organizations like Zions Bancorporation and Chase. Why are season reviews so powerful? 1. Creates alignment and more efficient communication with all the people, departments, and vendors involved with year-end processing. 2. Improves the overall process by bringing visibility to the impact tax reporting processes can have when they go well and when they don’t. 3. Creates better risk management (with penalties increasing twice this year) by facilitating valuable discussions and feedback needed to improve the accuracy of data, meet state and federal deadlines, and identify shortfalls and limitations of current systems and processes. This webinar will discuss six ways to help your review make a difference. •Decide when to conduct the review. •Determine who should attend the season review. •Set ground rules for the meeting in advance. •Set basic questions to use as a guideline for discussion. •Share and build on the results of the lessons learned. Wendy Walker is an experienced tax information reporting professional with over 15 years of reporting and compliance experience. In her former roles at Zions Bancorporation and Chase, she managed compliance and operations functions (and teams) associated with US withholding tax and 1099, 1042-S, and state reporting. Additionally, Wendy was the FATCA Reporting Officer at Zions, responsible for researching and advising the various lines of business of their obligations. Now that 1095 tax forms have been printed and mailed, organizations are focused on finishing work for this year’s ACA reporting requirement. Transmitting the 1094 electronic file to the IRS is the next step. This transmittal creates a new set of challenges for organizations with its process and complexities. Organizations must be prepared to handle the complicated corrections process it sets in place. Whether you’ve decided to build a solution internally or are currently using a third-party vendor for reporting, this webinar is focused on helping you understand what’s occurring throughout the transmittal component of the ACA landscape, offers insights of our observations in the market, and share some learnings from testing with the IRS to send transmittal files on behalf of our clients. With over 30 years of experience dedicated solely to tax information reporting, this isn’t the first reporting requirement rollout Sovos has been through. The IRS has raised penalty amounts once again. As stated in IRS announcement 16-11, these penalty increases include late and in-accurate filing, corrections, and maximum penalty cap for all tax information, 10-series, and ACA form reporting requirements. These increases apply for taxable years beginning in 2015! ★ Background on increases in 2015, regarding the Trade Preferences Extension Act of 2015. This legislation doubled the annual maximum penalty cap, and more than doubles the penalty per record for failure to file properly. ★ The latest penalty increases resulting from IRS 2016-11 increased the maximum penalty cap for corrections and failure to file as well as increased penalties per record for failure to file. ★ With penalty increases being announced twice within the last 12 months, what does this mean for my organization? How should I use this information during an internal tax season review? Please join us for this complimentary live webinar presented by Sovos Compliance. For additional information on the penalty increases from IRS announcement 16-11, visit our recently published blog announcing the changes. Sovos Compliance is the largest US filer of 10-series forms serving more than 4,500 clients across all industries including nearly half of the Fortune 500. With over 310 million 10-series forms processes last tax season, and nearly 30 years of experience dedicated specifically to tax information reporting processes, Sovos strongly believes in providing complimentary education webinars to support the greater community. One of the major new trends in indirect tax is the focus on transparency by tax authorities, is your organisation prepared? •Is there a specific approach in respect of e-audits? Various member states in the European Union will require companies to be much more transparent in the way that they account for VAT. They will seek to expand the VAT compliance requirements to include worksheets and other documents that provide a much more detailed snapshot of the company's business than the current VAT filings in close to real time. Casper Winkelman(link: https://www.linkedin.com/in/casper-winkelman-5a85005), General Manager Sovos Compliance VAT, will present a short business case for VAT automation, helping you prepare for new requirements and mitigate the risks from beginning to end. We invite you to register for this complimentary webinar today. You’re probably familiar with the Affordable Care Act (ACA) and its complicated legal changes, compliance obligations, and coverage requirements. You also may know a fair bit about the IRS reporting requirements in your efforts to be compliant this tax year as you work towards meeting your own obligations around this law. At this period in time, many organizations are focused on finishing this work for this year’s ACA reporting requirement. The deadline extension granted some relief with additional months to print and mail 1095 forms to employees and sending the 1094 electronic transmittal to the IRS—and this was just for reporting; this doesn’t consider the other business ACA impacts you’ve been working through. Whether you’ve decided to build a solution internally or are currently using a vendor to assist you in reporting, this webinar is focused on helping you understand what’s occurring in this ACA landscape and offers insights of our observations in the market. With over 30 years of experience dedicated solely to tax information reporting, this isn’t the first reporting rollout we’ve been through. Over the last couple of years, The Department of Treasury in Puerto Rico (“Hacienda”) has been making strides towards the implementation of a new VAT system that, as of this moment, is set to begin April 1, 2016. As this date draws near, there are still continuous changes being made that businesses need to be aware of. There will be 10 minutes reserved at the end of the session for questions. Register today and join us as we provide valuable information that will prepare your company for the April 1st update. There are a number of unique tax laws that retailers must know, stay up-to-date on, and abide by, including laws covering: cloud computing, clothing, maintenance contracts, and the automotive space. Join Erik Wallin, Senior Tax Counsel at Sovos Compliance, to learn more about the intricacies of these tax laws and how Sovos can help you achieve compliance, mitigate risk, and save time and money.